If You're Leading A Police Chase Through The Twisties, Why Not Steal A Boxster GTS? 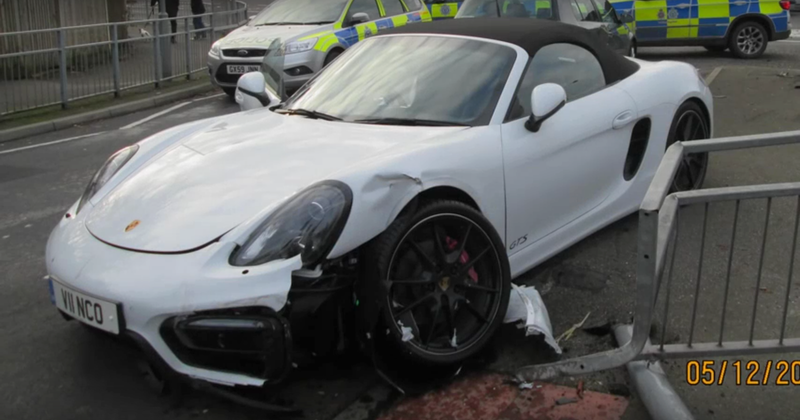 Clearly, what this British miscreant did was worthy of the six-year jail term he received, as we cannot condone the thievery and crashing of a poor, innocent Porsche Boxster GTS. However, given the roads he led police on for the chase, perhaps he stole the right vehicle? I’m just sayin’. The Boxster GTS is fantastic. According to CarScoops, the twenty-year-old man stole the formerly lovely Porsche with only 5 miles on its odometer before leading police on a brisk chase through the Sussex area last December. While that was quite a while ago, police only recently uploaded the footage, which shows once and for all that the Boxster GTS is an excellent choice for a police chase—provided you’re okay with being universally hated by Porsche owners everywhere for wrecking a such a great handling car. Look at how stable it is as it weaves in and out of traffic! It’s such a good car. Police captured the man after he crashed into an island in the road. CarScoops reports that the man was given six years in prison and suspended from driving for the following five years after his release for the offense. The thief pled guilty to all charges, as it’s a little obvious when your joyride gets captured on dashcam. Still, we’re not sure that’s long enough. Won’t somebody please think of the Porsches? !